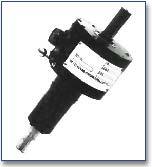 Rugged and cost-effective Slip Ring Torque Sensor available in 10 in-lb to 30,000 in-lb. Convenient Brush Release Lever allows the user to release the brushes from contact with the slip rings. This reduces wear during extended periods of operation when data is not required. A torque-sensitive element in each sensor utilizes bonded-resistance strain gage technology along with coined silver graphite brushes for data transmission. The strain gage bridge is configured to eliminate the effects of bending and thrust strains. Zero Balance @ 72 +/- 3°F 2.5% F.S.